Anne and I are holdouts. We, unlike the rest of the county, prefer in-person voting over the mail-in/absentee alternative. Call us old fashioned if you like (and this article does), but we really enjoy seeing our neighbors while we soak up the mood at our local community center on Election Day. We also think in-person voting is darn useful for getting get the kids involved in their democratic responsibilities at a young age. For my money, there’s nothing better for inspiring responsibility than bringing your kids with you to vote. I vividly remember standing behind my mom in the big metal voting booth and craning my head in wonder as she yanked the curtain and started pulling the levers that cast her vote. By the time I was old enough, those booths were gone (dang!) and I had to make do with hanging chads and coloring in bubbles. But I still got to vote. Booth or no, the experience is rich. Our polling place was just humming this morning. We’ve been voting at the same community center for 12 years and have never seen it so busy. The kids are already pros. Anne and I grabbed our ballots, they grabbed theirs, and we made our way to a clear spot on the same stage our oldest used for ballet class. I just love our multi-purpose polling places. Schools, grocery stores and libraries. Down the street, folks can choose their leaders in a Volvo showroom. Obviously that wouldn’t be the Carfreedays.com location of choice, but I wouldn’t mind casting a ballot in a bar, liquor store, or bike shop. We got down to business. The youngest drew pictures. The oldest “voted” via write-in. They wanted to know what we were doing (and what everyone else is doing) on the ballots. Inspired by the seriousness of the day, they wanted to “help.” We held brief ballot-side conversations on privacy, respect and the law (“you have to be 18 to vote”), while we filled-in our circles. 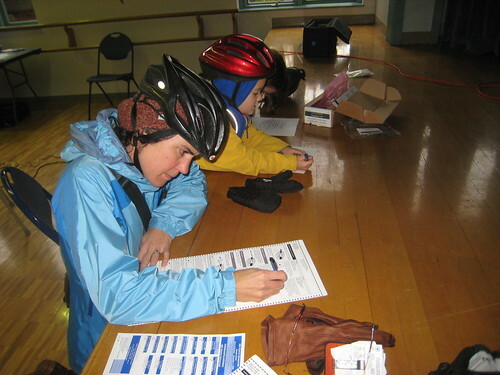 Democratic diligence filled, we slid the ballots into the “box” and hopped on the bikes for the uphill slog to school. All told, this priceless experience required the sacrifice of just 30 minutes. Maybe not as convenient as licking a stamp, but I think the experience was a pretty good investment. I’m not saying you can’t have a good civic event via mail—just that it isn’t our first choice. Some folks probably do a great job involving their kids in the mail-in ballot process. Props for that. This is America after all. Whatever works for them is cool with me. It’s just too bad this might be the last time we get to do what works for us, as King county is scheduled to go 100 percent mail-in for 2009. I’ll try to adapt. When that election comes, I like to think I’ll have the kids just as engaged. Maybe we can invite our neighbors over for a voting party and re-enact the polling-place experience. It could happen, but I don’t hold out a lot of hope. Us modern folks like to be efficient. If we can’t find time to get to the polls, will we really make time to have a vote party? I expect the real experience will be closer to this: Anne, me, a bottle of red wine, and some sharpies the night before the ballots have to be in the mail. Maybe even some Letterman, if he’s still on the air. We’ll still do a good job, but we’ll miss out on the the ritual, the people, and the ballet stage (not to mention the bike shop). But I’ll be glad I still got to vote! This entry was posted in alternative transportation, bigger than here, bikes, extravehicular activities, Human Powered Politics, xtracycle and tagged bikes, election08, election2008, xtracycle. Bookmark the permalink. The bike rack had four bikes and I had to squeeze the Xtra in there at my polling place. When I came out there were two different bicycles there. The sports page in our local attempt at a newspaper had a voting booth picture (staged?) with somebody in a helmet and funny looking shoes. However, it was under a “college football” headline. We saw a ton of bikes at our polling place including my X and 1 BD. that is so patriotic! 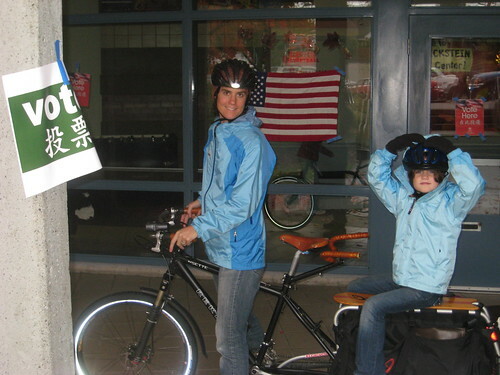 taking a bike and your kids to vote! Good for you! I agree with the sentiments on in person voting. I always look forward to it. I to remember “voting” with my parents in the big metal voting booth. What was wrong with them? Any idea how turn out is effected by mail in? I did ride to vote too. Usually I walk, but today I was in a hurry. Thanks everyone for the comments. I popped by the polling place again on the way home from work and there was another bike there. I hear all sorts of pros for mail-voting — reduces intimidation, provides equal access, etc… Some of those reasons are valid, but you can find compelling arguments the other way. Oh, and just saw a PI blog post where they asked readers if they’d miss voting in person. Responses seemed evenly split. In this eco-friendly environment where we’re being urged to use less oil, driving to a polling place is ecologically irresponsible. Anyways, I’ll miss it. But I’ll try to make the best of the mail-in experience, too.